Slovenian company BASS is looking for a Delphi developer (on-site in Celje, Slovenia). As the name says, “Design Patterns with Delphi” deals with design patterns. It is a bit different from most of design pattern books and websites you will find on the Internet. Case in point A: There are no UML diagrams. I don‘t speak UML. Tried to learn it few times but for some reason the whole concept doesn‘t agree with me. If you like diagrams, don’t fear though. Any book on design patterns - and most websites covering that topic - will gladly show how any design pattern can be diagrammed. That, however, is not important and should not govern your decision to buy the book. More important is case in point B: This book speaks Delphi. All the examples are written in Delphi and language features are used to the full. I also covered few less known Delphi idioms in separate sections. You’ll still be able to follow the discussion even though you may program in a different Pascal dialect. There’s also case in point C: Examples make sense. I deeply dislike classical design pattern examples of the “And then we want to write this program for different toolkits and it should also be able to draw circles, not only squares” kind. Euch! I tried to find a good example for each design pattern. Admittedly, I ended with few examples that draw triangles and squares on screen (mostly because some patterns were designed specifically for solving such problems), but most of them are of a more practical nature. This book covers all three classical design pattern categories - Creational patterns, Structural patterns, and Behavioral patterns. It also discusses patterns from the newer Concurrency patterns category. At the end I threw in some borderline-pattern(ish) topics and ended with a discussion of few patterns that cannot be strictly classified as “design” patterns. An introduction to patterns. Exploration of design principles, design patterns, and idioms. A mention of anti-patterns. A short description of most important design principles. Delphi idioms: creating and destroying objects. Creation patterns part 1. Singleton. Dependency injection. Lazy initialization. Object pool. Creation patterns part 2. Factory method, Abstract factory, Prototype, Builder. Delphi idioms: Assign and AssignTo. Structural patterns part 1. Composite. Flyweight. Marker interface. Bridge. Delphi idioms: comparers and hashers. Structure patterns part 2. Adapter. Proxy. Decorator. Facade. Delphi idioms: replacing components in runtime. Also: helpers. Behavioral patterns part 1. Null object. Template method. Command. State. Behavioral patterns part 2. Iterator. Visitor. Observer. Memento. Delphi idioms: for .. in. Concurrency patterns part 1. Locking. Lock striping. Double-checked locking. Optimistic locking. Readers-writers lock. Delphi idioms: tasks and threads. Also: bitwise operators. Concurrency patterns part 2. Thread pool. Messaging. Future. Pipeline. Writing Delphi programs. Event-driven programming. Actions. LiveBindings. Form inheritance. Frames. Data modules. Wrapping it up. Exceptions. Debugging. Functional programming. I hope you will like this book and learn a lot from it. I know I did during the nine months I spent writing it. And if you find any bug in the code, let me know so I can correct it in the second release! New OmniThreadLibrary is out! Get it while it’s hot! Version 3.07.7 is mostly a bugfix release. It fixes a stupid mistake introduced in version 3.07.6 plus some other minor bugs. On December, 6th I’ll be showing all that is new and shiny in 10.3 Rio to anyone that happens to pass by! Join me in Ljubljana at 9:30 in the “standard” venue … just don’t forget to register first. Delphi’s own System.Threading is even worse. In class TParallel, for example, there are 32 overloads of the &For class function. Thirty two! Not only it is hard to select appropriate function; it is also hard to decode something useful from the code completion tip. Check the image below – can you tell which overloaded version I’m trying to call? Me neither! After all these years, Delphi still surprises me. Apparently, as I found out today (by making a stupid typo), Copy(string, index, count) doesn't require the count parameter! Of course, this is not documented. I'd suspect that this goes waaaaaay back. I tested string version with XE2 and it works the same as in Tokyo. It is now official - I'll be participating both as a seminar and as a conference speaker on Delphi Day 2018 in Piacenza. This is a new experience for me - I had quite some presentations in Italy so far and I know that Italians are both great participants and excellent hosts, but I was never part of Delphi Day. On June, 6th I'll lead a seminar titled Writing High Performance Delphi Applications. It will be based on material from my Delphi High Performance book. We will look into variety of topics - algorithmic complexity, performance considerations when using built-in Delphi types, memory manager internals and optimisations and parallel programming. This will also be a good chance to grab a signed copy of the "high performance" and Parallel Programming with OmniThreadLibrary books (wink, wink ;) ). Next day I'll participate on the conference programme with a talk called Defensive programming for a better future. Without even starting Delphi (look ma, no hands!) I'll look into different areas of programming where some common sense and simple guidelines can represent a difference between well- functioning code and a nest of bugs. No matter how long you deal with it and how good you (think) you are, you will make a mistake. Usually, it will be a problem that will only exhibit itself in a rare circumstances, most probably on a hard-to-reach customer machine. With some (bad) luck it will only appear on Friday afternoons or during your vacation. That is why I'm always introducing multithreading with the "Don't do it yourself!" motto. Use a standard library! (And by that I mean OmniThreadLibrary, of course. ;) ) As your code, it too will have bugs. Unlike your code, it has 1000+ users running it in very different environments which means that at least it is tested as much as possible. There are, nevertheless, bugs that escape detection for a long time. In 2011, for example, I fixed a well-hidden problem in TOmniBlockingCollection ("Multithreading is Hard!"). As nasty as that was, it was nothing compared to the bug I found recently! As it turned out, the implementation of a bounded (fixed-size) multiple-producer multiple-consumer lock-free queue TOmniBoundedQueue (try saying that in one breath!) was buggy since its inception! As this queue is basis to all OmniThreadLibrary communication channels it is really surprising that the bug hid from everybody for 9 (yes, nine!) long years. 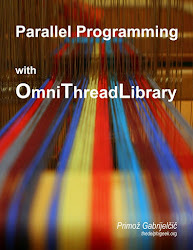 My first book Parallel Programming with OmniThreadLibrary is finally out! The book covers OmniThreadLibrary version 3.07.5 which was also released today. As this book was always meant to be documentation for the OmniThreadLibrary, my job doesn't end here. I will update and enhance the e-book whenever OmniThreadLibrary is updated and modified. All owners of the e-book will get these updates for the lifetime of the book. The printed book will also be updated, but most probably only with major updates to OmniThreadLibrary. There will not be an update for release 3.07.6 (if there will be such release), but most probably there will be a new version of printed book when OmniThreadLibrary 3.08 is released and there most definitely will be one when version 4.0 comes out. Here are your options at the moment. 1. If you would like to own the ebook, go to LeanPub. You can buy an ebook for $29.99 and package containing ebook + three webinars about the OmniThreadLibrary for $34.99. You can also buy an organizational license which allows you to give as many copies as you want to members of your organization. 2. To buy the hardcover printed book go to Lulu. For the next month the price is reduced from $49.99 to $45.99 as an introductory offer! I'm still deciding the possibility of also releasing a paperback version but I'm not entirely sure about that as paperback binding on Lulu is reportedly not of high quality. A price of the paperback would be about $10 lower than the price of the hardcover (that is the difference in print costs) and if you think that would make a difference for you, leave me a note. 3. To buy both versions (ebook and printed), go to Lulu and buy the printed book first! You will get an email with a link for ebook at reduced price $9.99 (and combo with webinars for $14.99). All existing owners of the electronic book should have already received an email with notification about the new release. This email also contains a link to a specially reduced printed book for mere $29.99! If you previously bought the ebook but didn't receive the email, let me know! Before I sign out for today, let me tell you that writing this book was lots of hard work but also a great joy and I could never do it without all the great people who bought the ebook before it was even completed. Thank you! OmniThreadLibrary 3.07.5 has been released. You can get it at GitHub or download the ZIP. There are only small number of changes in this release. Reduced number of times NameThreadForDebugging is called when threadpool is used. [VyPu] fixed race condition in TOmniCriticalSection.Release which affected code that was using TOmniCriticalSection.LockCount. OtlThreadPool did not respect OTL_DontSetThreadName define. About a week ago, Craig Chapman posted a vlog Lockless Multi-Threading in Delphi where he programmed a lockless communication channel which transfers messages between the main thread and a worker thread (or, actually, between any two threads). I do like Craig's implementation of a lockless queue. It is small, neat, and working. I also like that he approached multithreading from a communication viewpoint. I do, however, have several issues with how it is integrated into the application. While I whole understand the need for simple demo that viewers can understand, I feel that the Delphi world is full of such examples. That makes it hard for a newcomer to the multithreaded world to find appropriate patterns to copy. I love reading. I loved it since the (very) young days. As far as I remember, books were my friends. I also love - as I somewhat surprisingly discovered in my twenties - teaching and writing. I always kept to the short form - blog posts, magazine articles, and so on. Always - until few years ago I somehow decided that documenting OmniThreadLibrary would be best done in a form of a book.